More Information: Molded case, thermal magnetic type; 4.13 inch width x 3.38 inch depth x 6 inch height size; 480 volt max. ac voltage rating; 250 volt max. dc voltage rating; ul 489, csa c22.2 approval; 480 volt ac at 50/60 hertz, 250 volt dc voltage rating; 14 kiloamp at 480 volt ac, 10 kiloamp at 250 volt dc interrupting rating; 30 amp at 40 deg c current rating; 3 pole(s); standard pressure line and load terminal type; fd frame type; cutler-hammer brand; application panelboard, switchboard, motor control center; applicable standard nema ab1, as 2184, bs 4752, iec 157-1, sabs 156, sev 157-1, vde 0660; c, ehd model. The EHD3030L Circuit Breaker is available brand new and refurbished, with a full 1-year replacement warranty. WestCoastPower.com is your leading provider of Cutler Hammer EHD3030L Circuit Breakers. If you have questions about this product or need help identifying the part you need, give us a call. 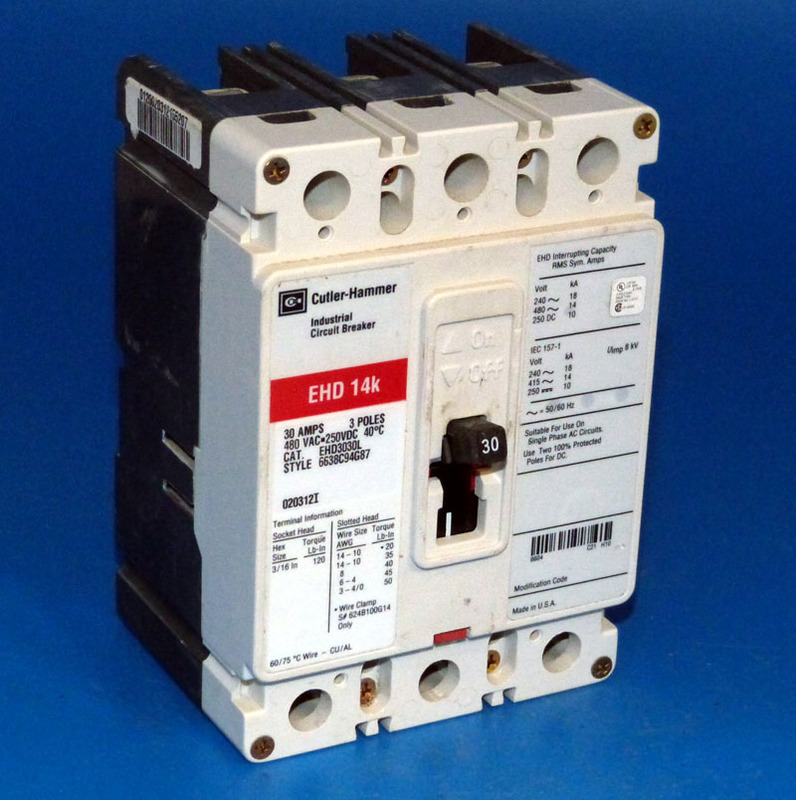 We also stock Circuit Breakers from Cutler Hammer that aren't listed on our website. If you don't see the specific Cutler Hammer Circuit Breaker you need listed, call us and we'll get it for you. If you have been quoted a lower price for this product, please let us know. We will do our best to give you the lowest price possible. Due to the nature of the reconditioning process, we don't always get a chance to get all of our products represented in our online catalog - some are often sold before we get a chance to list them. If you don't see it listed, chances are, we likely have it in stock or can get it for you fast - and all of our reconditioned products carry the same 1-year warranty that come with our new products. And we offer price matching on all products - if you find it cheaper elsewhere, call us. Order typically ship the same business day the order was received. Let us get you the Cutler Hammer EHD3030L Cutler Hammer Circuit Breaker Circuit Breakers you need, quickly.